A great start to the British Summer Championships for Dorset with eleven swimmers from five Dorset clubs taking part on Day 1 and resulting in the first medals of the Championships. Known more for prowess at longer distances, surprise golds in 50m sprints came from Poole’s Oliver Fairman and BCS swimmer Kayla van der Merwe who also both finished first and set new pb’s in the heats of those events. Ollie’s gold in the 16 years 50m Backstroke was achieved in 26.95, with Kayla clocking up 32.72 in the final of the 16 years 50m Breaststroke and knocking almost a second from the Junior County Record set by Beth Aitchison in 2013 with records broken in both heats and final. In the multi disability events, Clayesmore’s George Kelman-Johns’ (S14) ninth-place heat swim in the Mens MC 200m Freestyle produced a pb of 2:07.03 and a placing he maintained in the final with a time of 2:07.37. Photo (right): Day 1 and a 50m Backstroke gold medal for Oliver Fairman, presented by Swim England President Richard Whitehead. Another busy – and really great – day for the 15 Dorset swimmers competing resulting in four medals, five new County Records and plenty of pbs. Bournemouth Collegiate’s Alice Tai (S8) kick-started the day, finishing first in the heats of the Womens MC 100m Backstroke and not letting go of number one spot to take gold in the final in 1:09.13. Next came Kayla van der Merwe, finishing a comfortable third in the heats of the 200m Breaststroke in 2:34.06 while smashing the Junior County Record held for 18 years by Bournemouth Dolphins’ Charlotte Evans by over two seconds. A second Breaststroke gold for Kayla came from the 16 years final by clocking a further pb and a record time of 2:32.24. Oliver Fairman stepped up to the blocks for the 100m Backstroke finishing a creditable second in the heats with a 58.43 pb and new Junior County Record, then went on to take the bronze in the hard-fought 16 years final with a further pb and record time of 57.68. Determined not to take the runners-up spot this year in the 50m Butterfly, the last medal of the day came from Poole’s Jasmine McCrea with no-nonsense performances finishing first in the heats and just .09 sec ahead of the opposition in the 17/18 years final to take the gold with a pb and new Senior County Record of 27.08. Swim Bournemouth’s Ella Chown grabbed the last qualifying spot in the 15 years 50m Butterfly final before romping up the placings to finish fifth with time of 28.35, while Poole’s Alan Szczasiuk finished seventh in both heats and final of the 13/14 years 50 Breaststroke with a new pb of 31.68. The 800m Freestyle saw Theo O’Keefe (Poole), her first time at this level of competition for this event, confidently stick to her race plan to gain a personal best of 9:14.70 and earn ninth place in the 17/18 years age group. In the final of the Mens MC 100m Backstroke, George Kelman-Johns inched up a place from his heat swim to finish seventh with a time of 1:05.71. Photo (left): Day 2 and two Breaststroke golds for a jubilant Kayla van der Merwe. A quieter day for Dorset with only five swimmers competing in individual events but nevertheless ending with two medals, pbs and a handful of creditable placings. Alice Tai again dominated her multi-disability events finishing first in the heats of the Womens MC 100m Freestyle and repeating the performance in the final to win in 1:03.69, and finish just half a second off her 2018 Commonwealth Games personal best. In a hard-fought 50m Freestyle final and having clocked a pb of 25.94 in the heats, Jasmine McCrea snatched silver place just .02 sec ahead of her City of Sheffield rival in 25.88, a personal best which is now only .06 sec off the Dorset Senior County Record held by Karen Legg since 2003. Ranked fifth in the 16 years 400m Individual Medley, Oliver Fairman went into the final in ninth place but cranked up the pressure to finish fourth with a pb of 4:40.13. In the Mens MC 100m Freestyle, Bournemouth Collegiate’s Leo McCrea (S6) pb’d in the heats with a time of 1:14.25 and held on to that placing in the final with a time of 1:14.73, while George Kelman-Johns’ (Clayesmore) sixth place heat swim earned him a place in the final of the Mens MC 100m Breaststroke and eighth placing in 1:18.75. Rounding off Day 3, the Poole Womens 17/over 4x200m Freestyle team of Thea O’Keefe, Kath Baker, Teagan-Mae Graham and Jasmine McCrea finished ninth overall in 8:45.13. Day 4 resulted in some great swims for the 14 competitors from Dorset but with just Leo McCrea making a final. Grabbing the last qualifying place in the Mens MC 50m Freestyle with a pb of 33.53, Leo went on to finish tenth in a time of 33.88. Placing eleventh in the 100m Butterfly heats, and deprived of a place in the 17/18 years final by just .01 sec, Christian Tai (BCS) nevertheless cranked up his ranking by five places with a pb of 56.54. Also just missing out on a place in the final of the Mens MC 200m Individual Medley, George Kelman-Johns pb’d with a time of 2:27.06 to finish in eleventh place. 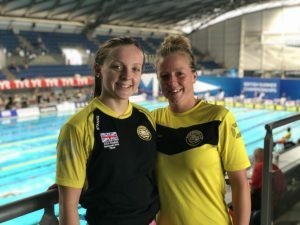 Dorset’s 1500m girls were out in force with Poole’s Thea O’Keefe and Kath Baker together with Swim Bournemouth’s Lucy Pearce and Alex Palotai-Avella qualifying for the female long distance freestyle event that was last included in the National programme in 2010. In the 17/18 years age group, Thea O’Keefe clocked up a 15 sec pb with perfectly paced splits to finish in ninth place with a time of 17:46.51 while, in the 19/over age group, Lucy Pearce (18:36.32) and Kath Baker (18:48.54) took sixth and eighth place respectively. Competing in the 14 years age group, Alex Palotai-Avella placed eleventh with a time of 18:08.36. Photo: Day 4, Poole’s 1500m Freestylers Thea O’Keefe (far left) and Kath Baker. Thirteen Dorset competitors today and no respite for Thea O’Keefe who stepped up to the blocks once again, this time for the 400m Freestyle. Placing eighth in the heats with a time of 4:25.99, a sliver short of her personal best, she went on to compete in the heats of the Womens 4x100m Freestyle with team-mates Jasmine McCrea, Fiona Hardie and Kath Baker finishing fourteenth in a time of 4:02.57, and later that day placed ninth in the 17/18 years 400m Freestyle final with a time of 4:26.86. Alice Tai continued her assault on the medals in the Womens MC 100m Butterfly, again finishing first in the heats in 1:10.39 and bagging her third gold of the Championships in the final with a time of 1:09.77. The 200m Individual Medley events saw Oliver Fairman and Kayla van der Merwe manage three new Junior County Records between them and a bronze medal for Ollie, who shaved 1.5 sec off his pb in the heats and a further 0.6 secs in the final with a time of 2:09.60, setting new records with each swim. Back in the pool after a two day break and ranked sixth in the 200m IM, Kayla van der Merwe inched into fifth place in the heats in 2:22.88 and then into fourth in the final with a pb and new Junior County Record of 2:19.94. George Kelman-Johns concluded his Championships with notable swims in the Mens MC 100m Butterfly, reducing his entry time of 1:07.59 to 1:03.96 and finishing in fifth place in the final. 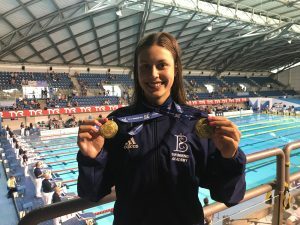 Last day of this year’s British Summer Nationals and Kayla van der Merwe had a hat-trick of golds in her sights and didn’t disappoint. Taking the 100m Breaststroke by storm she finished in number one spot with a heat swim of 1:12.88, a performance repeated in the 16 years final to romp home 1.5 sec ahead of the opposition with a pb and new Junior County Record of 1:10.50. Poole’s Oliver Fairman came next, placing fifth in the 200m Backstroke heats in 2:08.26 but going up a gear in the final to earn himself a bronze medal, a pb of 2:04.56 and knocking over a second off the Junior County Record set by Swim Bournemouth’s Nathan Theodoris in 2011. 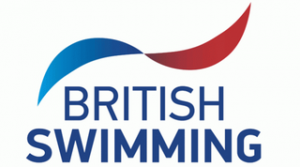 Swim Bournemouth’s Ella Chown and Poole’s Jasmine McCrea qualified for the finals of the 100m Butterfly in their respective age groups, both placing seventh and each clocking up a half second pb with times of 1:03.63 and 1:01.64 respectively. Rounding off the day, Seagulls’ Isaac Ellis clocked up two 50m Butterfly pbs finishing tenth in both the heats (27.87) and the 13/14 years final (27.78). 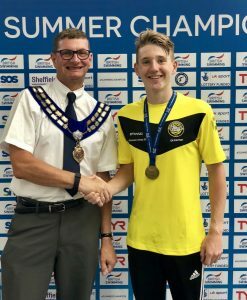 The six-day 2018 British Summer Championships ended at Pond’s Forge on 29 July with Dorset swimmers bringing home 12 British Nationals medals (eight golds, a silver and three bronze) as well as a dozen new Long Course County Records. This year’s total of 28 Championships qualifiers ranked nationally 1-24 in each event and age group came from Dorset clubs as follows: Bournemouth Collegiate (Alex Bryant, Leo McCrea, Grace Poynter, Alice Tai, Christian Tai, Oni Aiwo, Kayla van der Merwe and Finn Trehane), Clayesmore (George Kelman-Johns), Poole (Kath Baker, Oliver Fairman, Robbie Hemmings, Jasmine McCrea, Thea O’Keefe, Alan Szcasiuk and Oliver Weston with relay swimmers Louis Clayton, Ben Cutbush, Ollie Cleal, Teagan-Mae Graham and Fiona Hardie), Swim Bournemouth (Amy Brown, Ella Chown, Drew McGregor and Alex Palotai-Avella), Seagulls (Isaac Ellis), Tornadoes (Nathaniel Moorey) and Wareham (Tanya Blanchard). While many now travel south for a well-earned break, Theo O’Keefe, Kath Baker and Teagan-Mae Graham go east to nearby Rother Valley Park where the National Open Water Championships will take place on July 29-30. Missing from this year’s British Summer Championships was Poole’s Commonwealth Games finalist Jacob Peters who, together with other members of the British team, has not been allowed to compete at Sheffield in preparation for next month’s European Games in Glasgow. 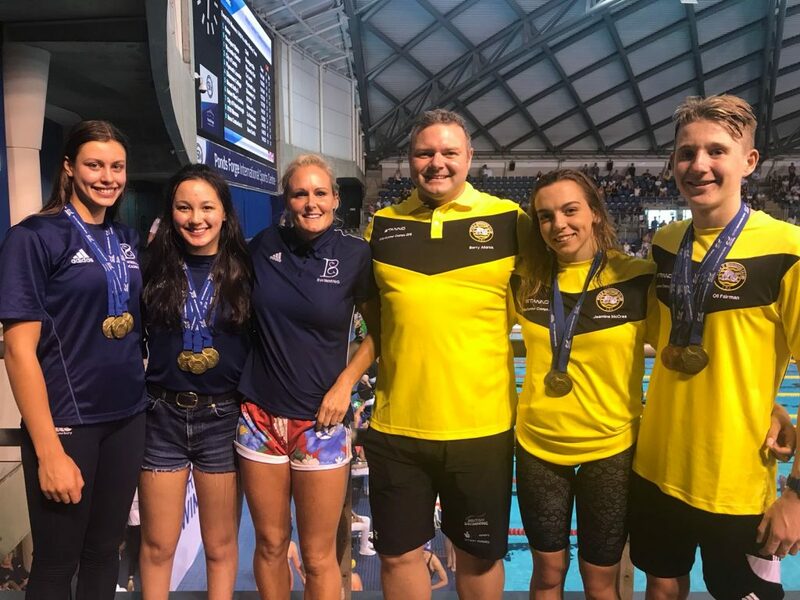 Photo: Dorset’s 2018 British Summer Championships medallists (l-r) Kayla van der Merwe, Alice Tai, Jasmine McCrea and Ollie Fairman with coaches Zoe Baker and Barry Alldrick.